Approximately 40 percent of American adults will live in a nursing home at some point in their lives. Most of these nursing home residents will be well cared for, but unfortunately some will be abused or neglected. In fact, reliable nursing home abuse statistics indicate that more than two million cases of nursing home elder abuse are reported annually. 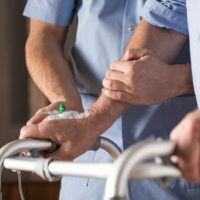 Therefore, it is important that everyone who comes in contact with nursing homes or their residents understands what constitutes nursing home abuse and neglect and is aware of the warning signs commonly associated with each. Failing to adequately provide for a resident’s physical and emotional needs. Improperly touching a resident or coercing them to perform sexual acts. Caregivers who do not want others to be left alone with a patient. If you suspect that a nursing home resident is being abused or neglected their safety should be your first priority. If someone is in immediate danger dial 911, otherwise, immediately report your suspicions to the Florida Department of Elder Affairs by calling their abuse hotline at 1-800-96-ABUSE (1-800-962-2873). Keep in mind that you do not need proof of abuse or neglect in order to file a report, your suspicion is enough for the department to launch an investigation. Once the nursing home resident is safe, you can then turn your attention to addressing the legal situation at hand. If the abused or neglected resident was injured due to their caregiver’s negligence, recklessness, or intentional acts it may be in their best interest to file a personal injury lawsuit in order to recoup their losses. While a financial settlement will not fully make up for a resident’s suffering, it can pay for needed medical care, rehabilitation, and other expenses that the victim incurs as a result of being abused or neglected. If you or a loved one is interested in pursuing a personal injury claim, contact the Mander Law Group today at (800) 557-0411 to schedule a free initial consultation with one of our experienced Florida personal injury lawyers.